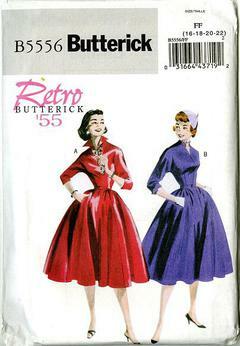 2010 Retro '55 Butterick #B5556 sewing pattern, misses' vintage full skirt dress and belt. Lined dresses, mid-calf, have semi-fitted bodice and gathered, flared skirt, winged or stand-up collar, below elbow kimono sleeves, size zipper and side front pockets. Petticoat purchased separately.